The Tzeentchii champ is nearing completion. Time to pick a shield - after some rummaging I found this classic in my drawers. Nice work. Looking forward to seeing it finished. Cheers! Only the shield left now! 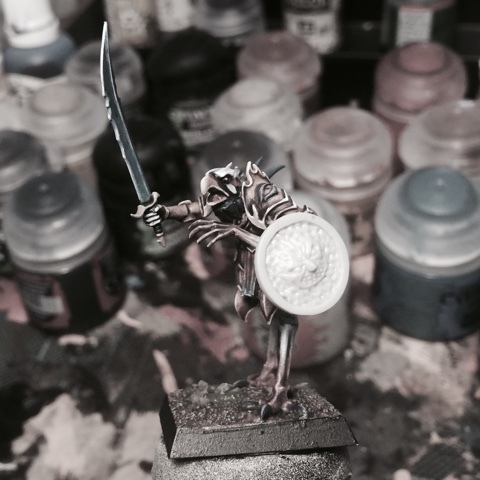 The champion is coming on a treat – the mini-griffon head is an inspired conversion. That shield really reeks of school - I was pretty happy when I found it! Very nice choice of shield. If my memory serves me correctly, that is in fact an old (circa 1987-9) Goblin shield from the old Warhammer Fantasy Battle Armies box which contained 10 each of a Wood Elf, Dark Elf, Skaven, Dwarf, Orc and Goblin and cost the princely sum of £10! Yes, that's right, 60 figures for a tenner! Those were the days......! I look forward to seeing it painted. I bought that box in -92 I think - it was the first plastics I ever bought. The sculpts are actually pretty good - the skaven especially - but the production technology is stoneage level compared to now. That shield is a classic. I was lucky enough to have two in my collection. I have that same one somewhere. It's perfect for this project! Cheers! I thought so too! That shield is pretty much as old school as it gets, great choice. Wow, what a great find! The shield really help instill an old-school vibe to the model. Perfect! Yep. Doesn´t much more oldhammry than that. The shield fits in nicely with the Tzeentchian aesthetic!